Not many floors compare to Plankfloor®. As an engineered hardwood floor, it looks and feels exactly like solid wood. However, you won’t have to deal with the inherent problems often associated with solid wood flooring. Plankfloor is also easy to install and maintain. How does Plankfloor® produce such reliable floors? Plankfloor®s start with fine hardwood lumber. The lumber is sawn into a 3/16" wear surface comparable to solid 3/4” wood flooring. Multiple plys of hardwood veneer are then laminated to the surface. The result is Plankfloor®, an incredibly beautiful and stable wood floor that you’ll enjoy for a lifetime. Plankfloor is manufactured in a variety of standard widths and long average lengths up to 7-1/2 feet. It can be glued directly to concrete on or below grade, or installed on most wood subfloors with standard 3/4" nail and staple guns. If a random and uniquely patterned wood floor is desired, we offer pre-packaged cartons with equal lineal footage of 3, 4 and 5-inch widths. Plankfloor can be glued directly to concrete, nailed or stapled to any wood subfloor, or floated with PlankLoc, Owen's patented installation system. Hardwood floor installation instructions are available for each type (Click here for more detailed installation information). If you are unsure which method to use, contact a flooring specialist @ 1-800-343-6394 or contact floorings.com via e-mail. 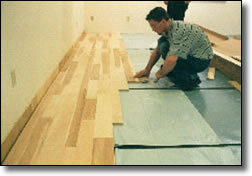 Another resource is the National Wood Flooring Association (www.nwfa.org). Inspect all materials carefully before installation. Warranties do not cover materials with visible defects once they are installed. It is the responsibility of the installer/owner to determine if the job site sub floor and job site conditions are environmentally and structurally acceptable for wood flooring installation. Owens Flooring Company and Floorings.com declines any responsibility for wood floor failure resulting from or connected with sub floor, subsurface, job site damage or deficiencies after hardwood flooring has been installed. Wood is hydroscopic. It will absorb and expel moisture based on its environment. Plankfloor is 100% hardwood and is not immune to these changes. With Plankfloor’s multi-ply construction, these changes are greatly reduced. However, for the best results we recommend that Plankfloor be acclimated in a controlled environment prior to installation. For More Detailed information on Owens click here.